After our obligatory footsteps in Traunkirchen, we move on to the Hallstatt. The village Hallstatt is such an unbelievably spectacular place that even the Chinese have created a copy of the ancient salt mine village. But only in the original will you discover this truly unique culture with such a history all in a breath-taking mountain setting. The market municipality was already inhabited in the 1st millenium before Christ: during this period - the iron age - the civilization flourished. 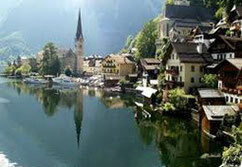 The following pages you will discover all there is to make your trip to Hallstatt an unforgetable one. 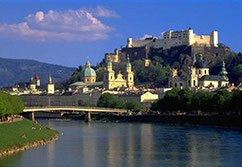 From there we will continue to Salzburg. I will show you all this marvelous sights of the old city like: the Cathedral, Hohensalzburg Fortress, the Residenz, St. Peter's Monastery with its impressive cemetery, the Franciscan Church and Collegiate Church as well as the Large and Small Festival Halls and the Summer Riding School in the Festival District. On the right banks of the Salzach one should not miss Mirabell Palace with the romantic Mirabell Gardens (one of the city's most popular snapshot scenes) or St. Sebastian's Church with its charming cemetery. And finally the main sight of Salzburg, Mozart Birthplace! 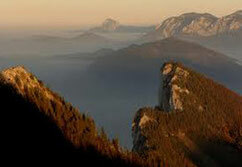 After the walking tour In the late afternoon I will take you to Vienna and back to your hotel.